It's the bottom of the ninth inning. The game is tied. It's down to the home team to score one run to win it all. Unfortunately, the home team is staring down the league's best closer. 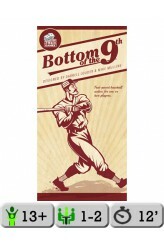 A dice and card game for two players, Bottom of the 9th brings all the excitement of the final three outs of a baseball game into a compact 5-20 minute game session. With variable player strengths, bluffing/deduction, and die-rolling, only the pitcher knows what's coming and the batter needs to keep his eyes peeled. Bottom of the 9th is played over the course of three outs, or four hits (for one run scored) — whichever occurs first. Bottom of the 9th includes tons of variable player powers, myriad customizable line-ups, the possibility of two added expansion packs, and rules for advanced league an.. Compounded is a game about building chemical compounds through careful management of elements, a fair bit of social play and trading, and just a bit of luck. 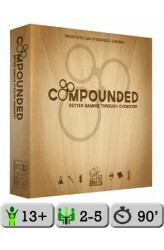 In Compounded, players take on the roles of lab managers, hastily competing to complete the most compounds before they are completed by others – or destroyed in an explosion. Some compounds are flammable and will grow more and more volatile over time; take too long to gather the necessary elements for those compounds and a lot of hard work will soon be scattered across the lab. Although Compounded does involve a fair share of press-your-luck tension and certainly some strategic planning, the most successful scientists will often be those who strike a good trade with their fellow lab mates. Players are able to freely trade eleme.. 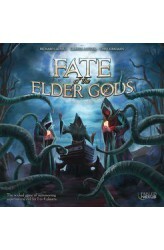 In Fate of the Elder Gods, players take on the ever-maddening role of cults trying to summon ancient evil and herald the fall of mankind! Each cult is in competition to be first to summon their god, but they all must also repel intrepid investigators working to seal off the gate to beyond with Elder signs. Gather arcane artifacts, cast powerful spells, embrace the Dark Gift of your Elder God, and be first to hasten doom...before it's too late! During the game, players use a variable hand of spell cards to do one of two things to aid their cult in their mission: Use the spell's Astral Symbol to navigate the areas around Arkham on the unique Fate Clock board, or use the symbols in a location's Astral Column to ready a spell. Readied spells can be cast at any time, but while in a ..
A mad scientist holds the world hostage with his terrifying inventions. An alien warlord from a far away galaxy brings his limitless army of bizarre minions to conquer the planet. A giant rampaging robot cuts a swath of destruction across the coast, destroying major population centers. And who will stand in their way? A team of heroes, all with impressive powers and abilities stand between the world and the forces of evil. Will you help them? Answer the call to protect the multiverse! 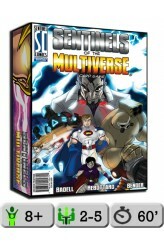 Sentinels of the Multiverse is a cooperative, fixed-deck card game with a comic book flavor. Each player plays as one of ten heroes, against one of four villains, and the battle takes place in one of four different dynamic environments. Each player, after selecting one of the heroes, plays a deck o..
Ansel G. Moreau, world-famous French action movie star, has a few dark secrets. His hobby of big game hunting has spiraled out of control – his constant need for bigger and more threatening prey has him hunting the very heroes that protect the earth! To this end, he employed a shady genetics corporation to give him superpowers, but the process went terribly wrong, scarring his million-dollar face and ending his acting career. However, he did gain some new, energy-manipulation abilities from the process, which he plans to put to good use. Taking the name Ambuscade, he employs his new powers and a vast arsenal to hunt the heroes he considers to be the most dangerous and powerful. At the top of his list? Haka, the ageless Maori warrior. No one else could provide a sufficient challenge .. 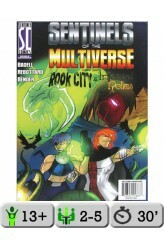 This double expansion combines Rook City and Infernal Relics, the first two expansions to the Sentinels of the Multiverse card game, in a single box. Dark streets, vile sewers, and twisting alleys; all home to the terrible criminals that control this city. 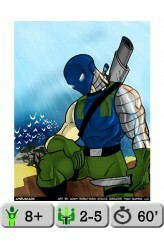 Welcome to Rook City, where evil never sleeps. 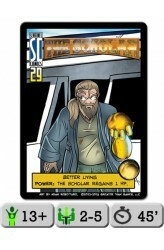 Sentinels of the Multiverse: Rook City is the first expansion for the cooperative comic-book themed card game! It features 2 grim heroes, 4 terrible villains, and 2 challenging environments. Besides just expanding the number of characters and settings available to players, Rook City introduces new mechanics and exciting new challenges, while still maintaining the rules that make Sentinels of the Multiverse fun! 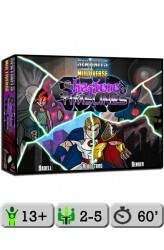 Ancient deities, extra-planar elder gods, and dark spirits threate..
Sentinels of the Multiverse: Shattered Timelines features two new time-traveling heroes, four villains (some of which may be familiar to Sentinels fans), and two time-displaced environments! Besides just expanding the number of characters and environments available to players, Shattered Timelines introduces new mechanisms and exciting new challenges. Can you repair time before it runs out?! 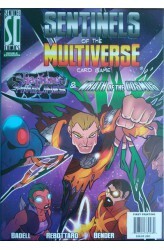 https://www.youtube.com/watch?v=LmqjHAsksas ..
Sentinels of the Multiverse expansions Shattered Timelines and Wrath of the Cosmos boxed together. 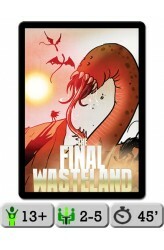 This was printed first for Everything Ever+ backers of the Sentinels of the Multiverse: Oblivaeon kickstarter. Sentinels of the Multiverse: Shattered Timelines features two new time-traveling heroes, four villains (some of which may be familiar to Sentinels fans), and two time-displaced environments! Besides just expanding the number of characters and environments available to players, Shattered Timelines introduces new mechanisms and exciting new challenges. Can you repair time before it runs out?! The far-reaches of space have converged on the earth! In Sentinels of the Multiverse: Wrath of the Cosmos, heroes must join forces to d..
Silver Gulch is a good town. Well, it was. Before them Hayes boys rode into town, that is. Since then, most of the townsfolk've cleared out. Hightailed it out of town, and just in time, too. Now, every street corner is filled with the sounds of breaking glass, hootin' and hollerin', and gunfire. Last night, there was a strange, warbling sound, and a bright flash of weird light. Some folks in funny clothes came walking out of thin air, but they looked as confused as the rest of us! They're clearly far from home. Wasn't long before the Hayes brothers were taking pot shots at them, too. 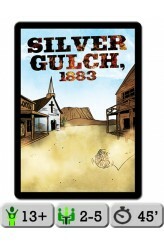 --- Due to the Time Cataclysm, the heroes and villains have been transported back to 1883, to the infamous town of Silver Gulch, where the air is thick with swears and bullets. You have to survi.. In one of the timelines in the Multiverse, the monsters and bizarre creatures we think of as myths and urban legends grew stronger and stronger while hiding from the human race, which hated and feared them. Given enough time to flourish and multiply, they finally broke out of their hiding in darkness and obscurity, hellbent on revenge! They slaughtered their way through the human population of the world, destroying all they touched. The human race rallied, but ultimately, the monsters from their greatest nightmares were too strong and too numerous. Decades turned into centuries, and centuries became millenia - the world, now overrun entirely by monsters of all sorts is a terrible wasteland. The few points of light in the darkness have long been extinguished. This could be the most t..
No one really knows where John came from. He just showed up one day in the Everglades on his houseboat. The gators didn't seem to pay him much attention. Once in awhile, one would crawl up on his boat, and John would come out and talk to it in hushed tones until it wandered off. Folks found John strange, but it was clear he wasn't trouble. Just a kindly old coot who kept to himself. All sorts of stories were made up about the strange, swamp-dweller, but none came close to the truth. John Rhodes was, in fact, the world’s most talented alchemist, and wielder of the Philosopher’s Stone. John had always had an affinity for altering the very threads of existence. He could feel them as they stretched around him, connecting everything to everything else. So, when those lines drew him t..